This season was a highly competitive one for volleyball teams around Jackson County as was evidenced in particular by the Holton and Royal Valley squads finishing in the top three of the Big Seven League standings, which led to a lot of highlights. Royal Valley had a lot of those this fall as the team recently capped an impressive run by claiming the first sub-state championship, first state trophy (third) and most wins (26) in the 41-year program history. Both the Panthers and Wildcats also spent most of the season in the top 10 of the Kansas Volleyball Association rankings, with their spots mirroring their strong seasons. Jackson Heights wasn’t quite on the same level, especially after dealing with some early struggles, but the Cobras had some strong moments towards the end of the season, too. 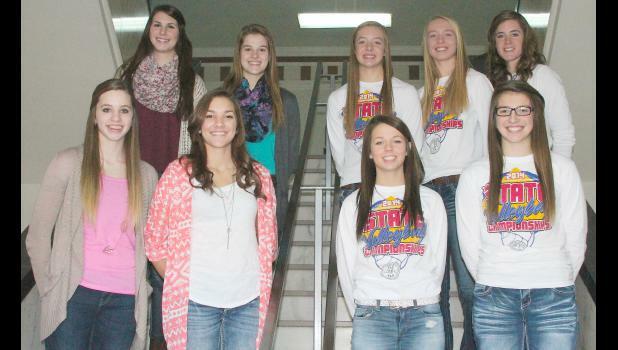 While Royal Valley might have been the only state competitor this fall, there was still quite a talented pool of players to choose from for The Holton Recorder’s All-County volleyball team and listed below are the players who made the cut. Hannah Beam, RVHS, sr.— The Panthers achieved all they did this fall on the back of a total team effort, but Beam certainly helped stoke that collective fire and keep it burning. As the go-to hitter, Beam came up big for Royal Valley time and time again over the season from key league matches to the sub-state tournament to 4A-DII state competition where she had a huge performance (15 kills, 12 digs, six blocks, three aces) in the final match of pool play to secure the Panthers’ spot in the semifinals. That kind of showing was routine for Beam as she rarely left the court for Royal Valley throughout the season and contributed in all areas on the floor, leading the team in kills (251) and finishing second in digs (265), third in aces (26) and fifth in blocks (62). Beam was an All-League selection for the second time this season, picked for the All-State tournament team in Class 4A-DII and is making her second appearance on the All-County roster. Hayley Thompson, HHS, jr.— Another big hitter who proved to be a rally-starter for her team, Thompson came up big for the Wildcats in her first full year of varsity action. After getting glimpses of her strong attacking skills last year, especially towards the end of the season, Thompson had a breakout campaign in 2014. She led the team (and all county teams) with 268 kills this season. Thompson’s impact showed on the court as the offense wasn’t quite the same when she was out of rotation. For her efforts, Thompson was named All-League in the Big Seven this year and is a first-time pick for the All-County squad. Anna Johnson, RVHS, jr.— While not on the court as much as Beam, Johnson was another key starter that helped boost the Panthers at times this season. A dominant presence in the middle, Johnson caused a lot of problems for opposing teams at the net this fall as she led her team (and the county) with 234 blocks in the 2014 campaign. She also contributed with 139 kills this season as well. Johnson helped spark the Panthers’ play at the net throughout the course of the season, including at the 4A-DII state tournament. She was selected to the All-State tournament team for her efforts and also earned honorable mention on the Big Seven All-League team. This is her first time being selected for the All-County team. Sarah Beam, RVHS, so.— The younger of the Beam sisters was no less formidable on the court this season as she finished just behind Hannah with 223 kills this season. While Hannah finished with more kills in the final tallies, Sarah had the advantage in force as she always seemed to add a little extra “oomph” on her kills and come up big down the stretch at times, including three straight kills in to end a must-win match against Holcomb during state competition. Like her sister, Sarah also contributed all over the court and finished the season with 140 digs and 65 blocks as well. She was picked as an honorable mention for the Big Seven All-League team and is a repeat selection for the All-County squad. Megan Rhule, HHS, jr.— Speaking of players who rarely left the court and did a little bit of everything for their teams, Rhule certainly fit that bill. In a season in which the Wildcats were hit hard by illness and injury, Rhule was one of the few players to see the court in nearly every set and she had a hand in so much of what the offense did, leading Holton and the county with 570 assists this season. Rhule was at home all over the court as she also finished with a team-high 62 aces, 86 kills, 28 blocks and 87 digs over the course of the season and proved to be a dynamic force that helped the Wildcats finish as runner-up in the Big Seven League. She was rewarded individually with All-League honors and is appearing on the All-County roster for the second straight year. Jaycee Worrell, RVHS, sr.— Defensively, there were a lot of players who were required to cover a lot of ground for the county teams, but none did it better than Worrell this season, who led everyone with 456 digs. The Panthers’ libero was a player who coach Denise Visocsky noted as an impact player time and time again, because when her defense was on chances were Royal Valley was rolling. Worrell kept several key rallies alive throughout the course of the season to help the Panthers in their record-setting campaign while she earned All-League honors herself and is back on the All-County team for the second consecutive year. Mallory Fate, HHS, sr.— Another strong defensive player, Fate had to adapt to an even larger role when those injuries started to hit Holton. Fate went from being a defensive specialist to the starting libero fairly early in the season and she made the transition look smooth. Having already contributed on the back row, Fate just made that much more of an impact at libero as she finished the season with a team-high 237 digs, helping the Wildcats to their 21-13 finish and earning a spot on the All-County roster for the first time. Aidan Allen, JHHS, sr.— While the Cobras had some ups and downs through the course of the season, Allen was a constant on the court throughout the fall with key contributions all around. Allen finished as the team leader in kills and was among the leaders in digs and blocks as well, helping the team to some strong moments towards the end of the season. She is being selected to the All-County team for the first time this season. Caitlin Burns, RVHS, sr.— Filling in as the jack-of-all-trades for the Panthers, Burns helped the team in any way she could this fall and made contributions from both the front and the back row. Burns finished third in both blocks (88) and digs (207), second in aces (28) and also had 54 kills on the season on the way to Royal Valley’s third-place finish at state. She is a first time selection to the All-County squad. Honorable mention selections for the All-County squad include Kate Hanson (RVHS), Ashley Cook (HHS), Erica Pruyser (RVHS), Hannah Williams (JHHS) and Tori Bontrager (HHS).